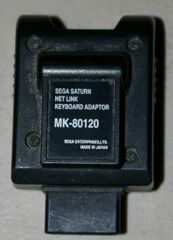 NetLink Keyboard Adapter is an accessory for the Sega Saturn, allowing keyboards with PS/2 inputs to be used with the console (thus acting as an alternative to the NetLink Keyboard). It was only released in North America. Strictly speaking the peripheral has nothing to do with the NetLink service, though in North America, only NetLink-compatible software made use of keyboard attachments. Interestingly no such device was released in Japan, forcing users to purchase a Saturn Keyboard.